Is it just me, or are s’more themed/flavored desserts popping up everywhere? 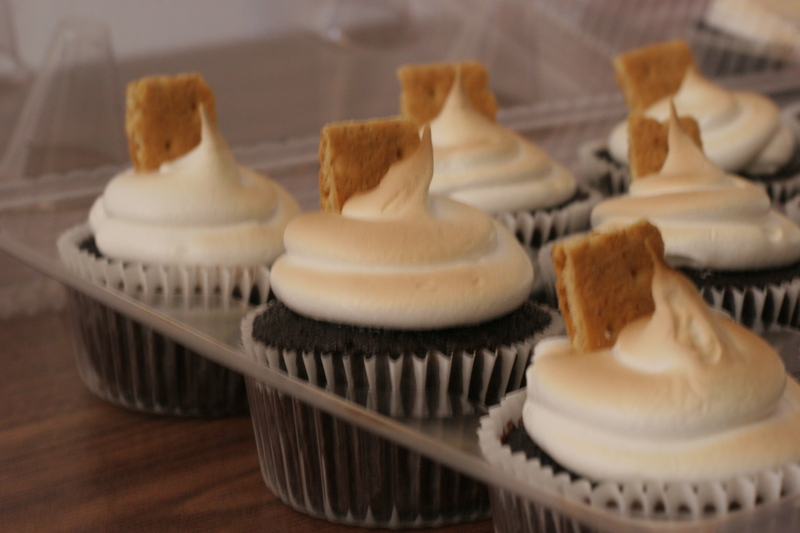 I remember mentioning to a friend a few months ago that I wanted to try making s’more cupcakes, and the next thing I knew, the Interwebs were exploding with s’more desserts. This is one time I can say I did not intentionally jump onto a bandwagon…I swear I came up with this idea all by myself, even if the rest of the world managed to share their successes and brilliance before I did. Oh well. If you’ve ever read this poor excuse for a blog, you’ll know that updating and managing it is not my strength. 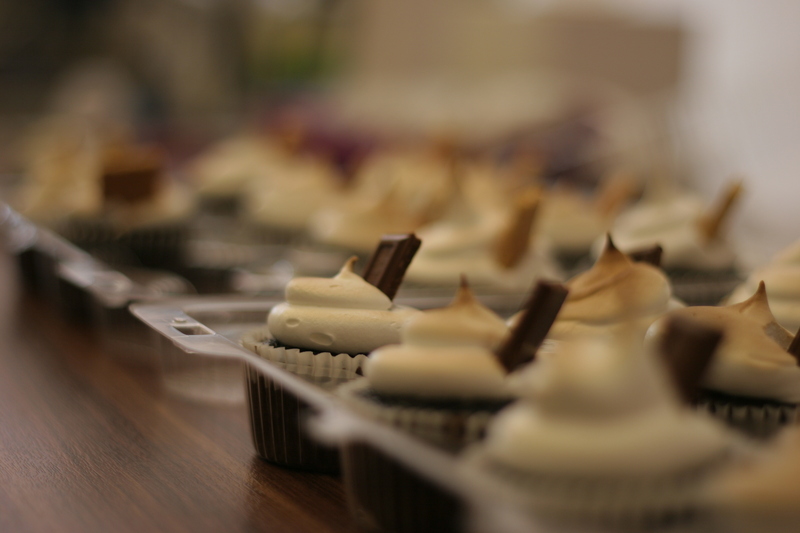 So my contribution to this s’more trend are some s’more cupcakes that I made for a friend’s birthday and some s’more bars that I did in an attempt to use up the rest of the marshmallow/graham cracker/chocolate bar excess. 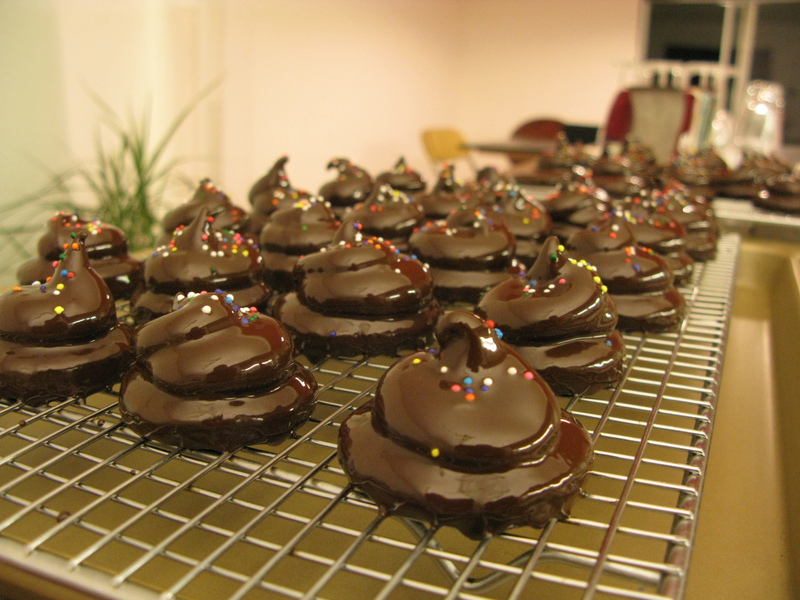 I probably made a few dozen too many. Not a bad problem to have. 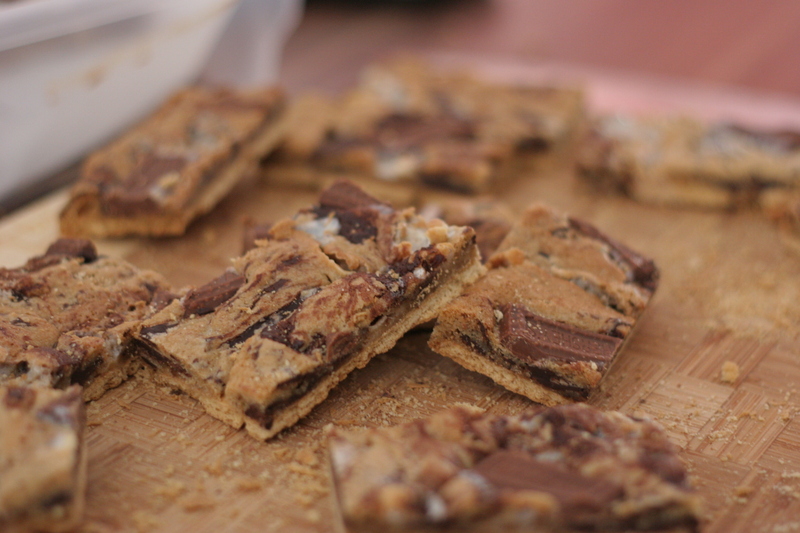 and then the s’more bars…forgive my photography. we got a new camera and I’m still trying to learn how to use it. 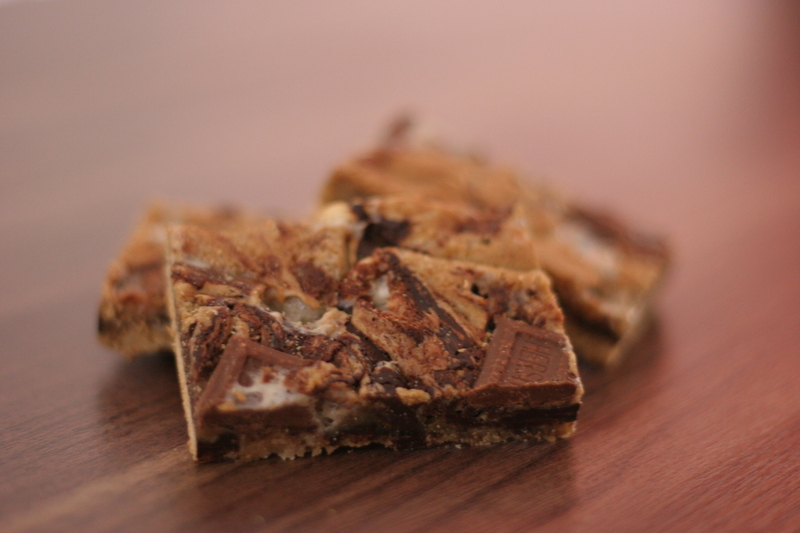 These are essentially my basic chocolate chip cookie dough with marshmallows mixed in layered on top of a base of graham crackers…and a few strategically placed pieces of a Hershey’s bar. This all started a few months ago, during Girl Scout Cookie season, when I was at work. 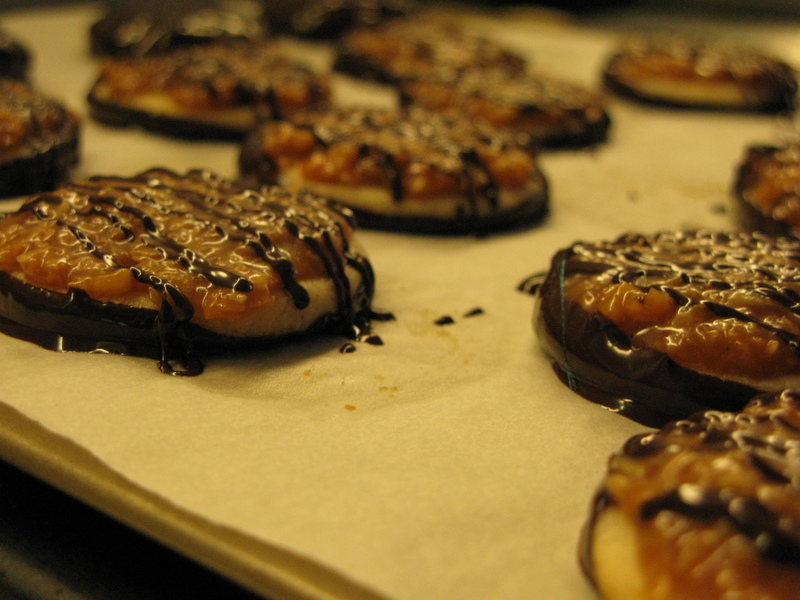 Somebody had a box of Samoas (or Carmel De-Lites depending on your preference) and someone basically challenged me to re-create them at home. I have to admit, it’s something I’ve been thinking about for a few years. Apparently, I’m not motivated enough to do anything until someone tells me I can’t. How did they taste? 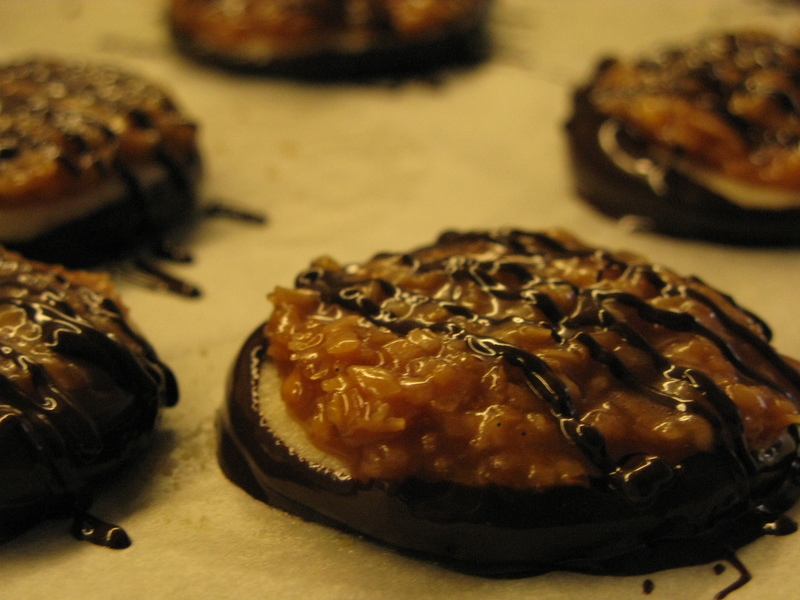 People loved them…I was told it tasted like a better version of the actual Girl Scout cookie. If I remember correctly, I wasn’t originally too into them. I thought I had completely missed the mark. However, after a few days in the fridge, the flavors kind of melded together and improved them immensely. This is obviously not one of those blogs where you readers (Hi Mom!) are going to glean a whole lot about my personal life…I would have to update far more frequently for anybody to get a sense of what my real life is like…but fortunately for all of you, I’m too lazy. But this post will make more sense if I give a little bit of background into what I’ve been doing lately. I recently came home from a long-overdue vacation. It had been nearly 2 1/2 years since my husband and I had been on any kind of real vacation, and an opportunity came up where we were able to go to Paris! So off we went to the land of bread, cheese, wine, and pastries! Oooh…the pastries. If I had done nothing other than walk from patisserie to patisserie sampling the wares, I would have considered it a successful vacation. However, since my husband and the friends we were traveling with probably would not have had such views, we spent most of our time doing the typical tourist stuff, and fitting in pastry-sampling here and there. I returned home inspired. 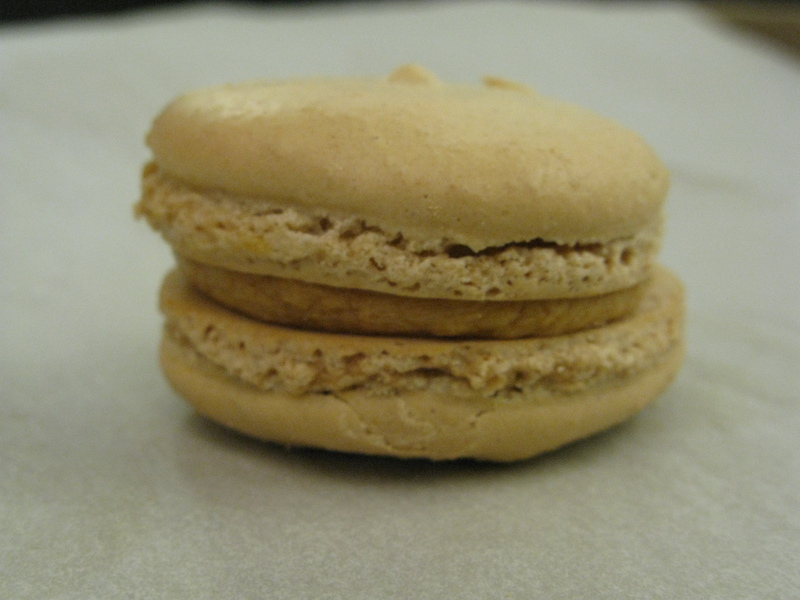 Having sampled real Parisian macarons (don’t worry, I did it right. 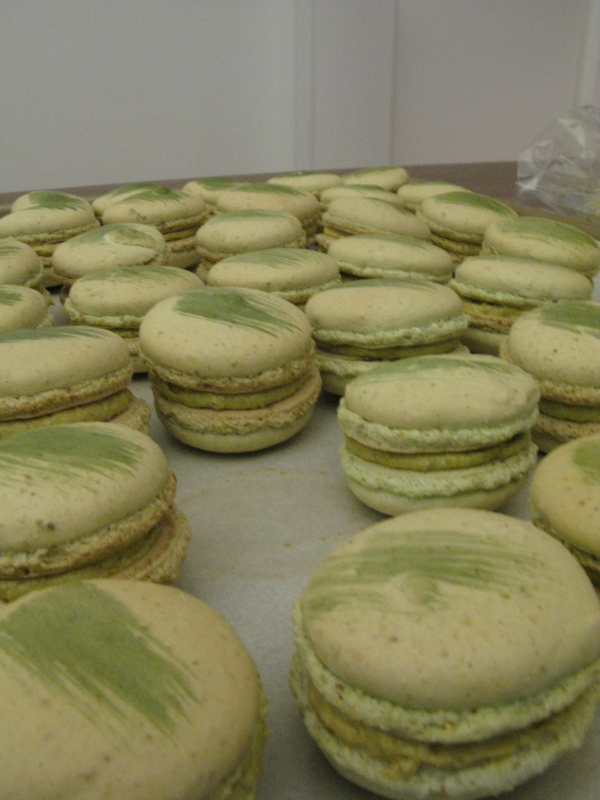 Pierre Herme and Laduree were on my list), I felt an intense need to try my hand at them once again. 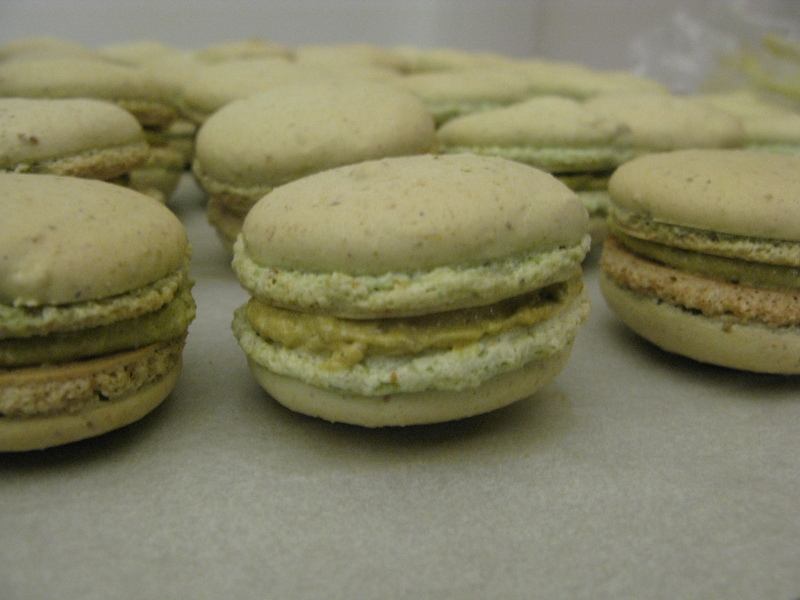 For years now, I’ve been wanting to make pistachio macarons. 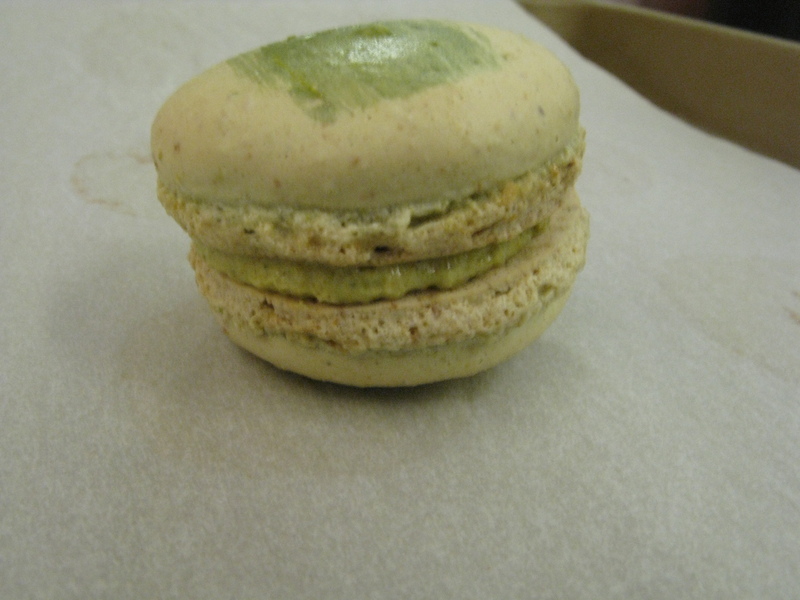 I wanted a macaron with an intense pistachio filling and shell. 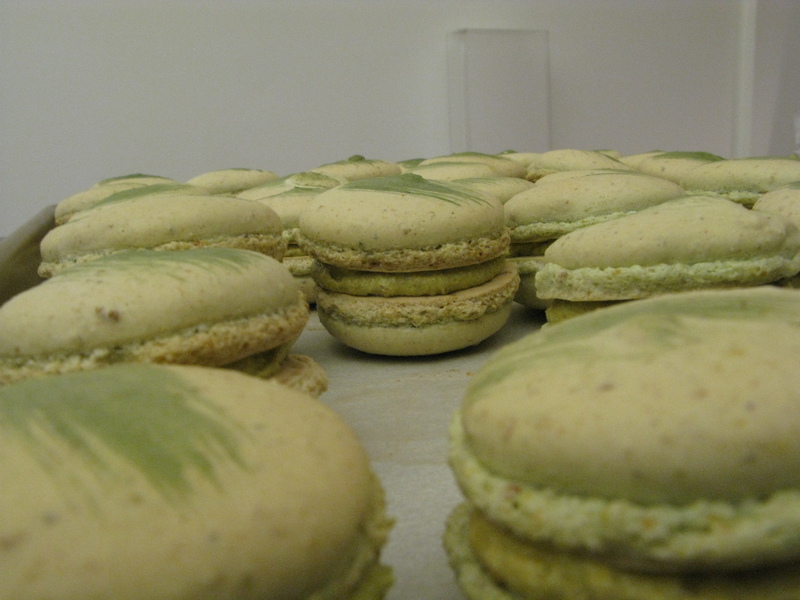 Something that just screamed, “PISTACHIO!” So here was my attempt. 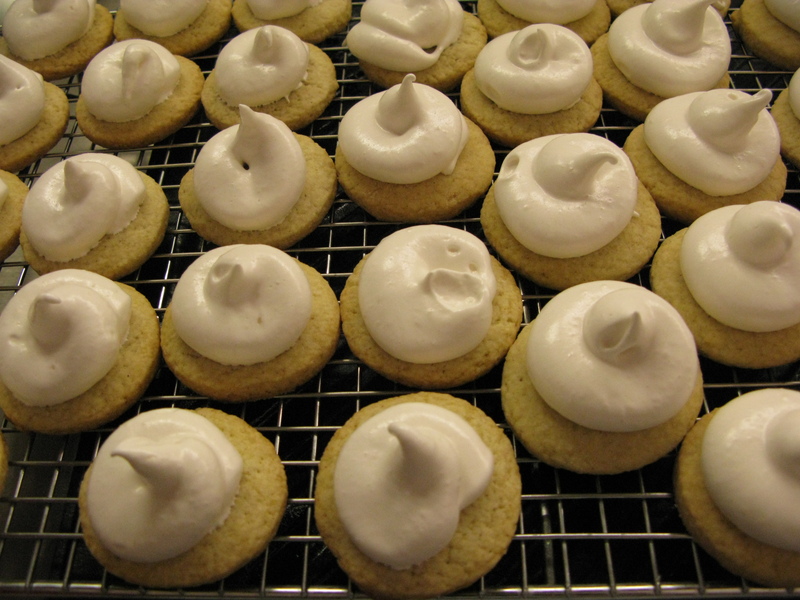 First up the shells: a quick Google search indicated to me that Pierre Herme favors the Italian meringue method for making his shells – a technique that I had shied away from due to the necessity of pouring a boiling sugar syrup from a pot into a whirling mixer. I saw huge sugar burns in my future. 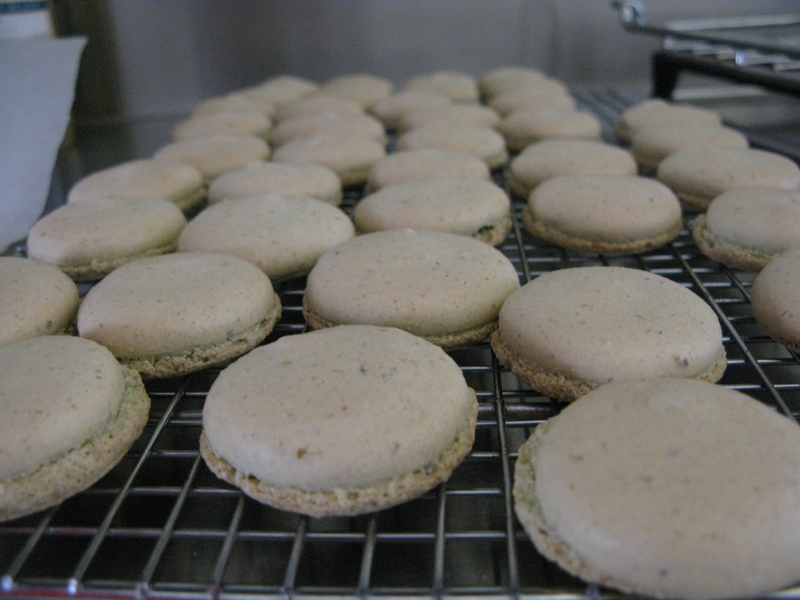 But if Pierre Herme thought that was the way to go, who was I to argue? 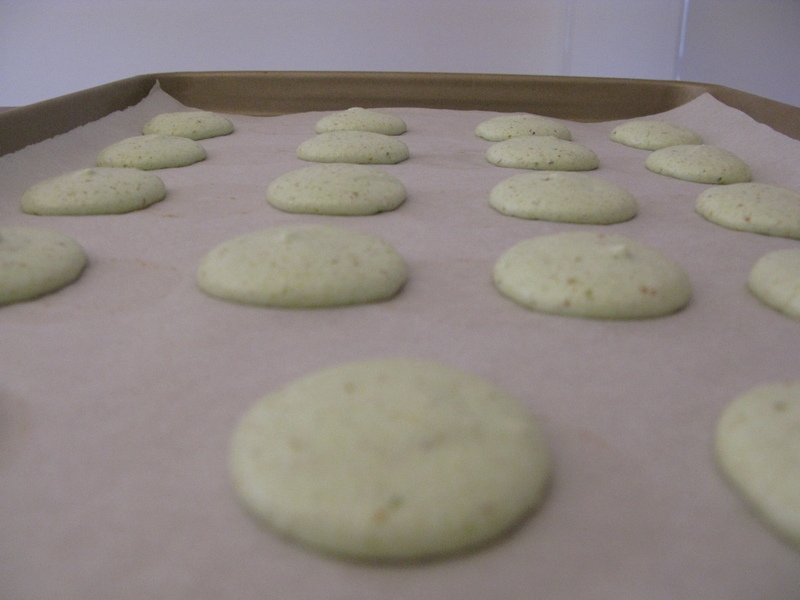 So off I went, grinding pistachios and almonds into a fine powder and mixing them with my powdered sugar. After whipping up my aged egg whites (Pierre recommends aging egg whites for at least 48 hours, according to the interweb.) and boiling up my sugar, I very carefully poured the sugar into the egg whites. And to my pleasant surprise, no spillage! No splashing! No third degree burns! For some reason, they were awfully brown. I’ve never really had issues with the shells browning before, but these went from that lovely pale green to a toast-y brown. Bummer. 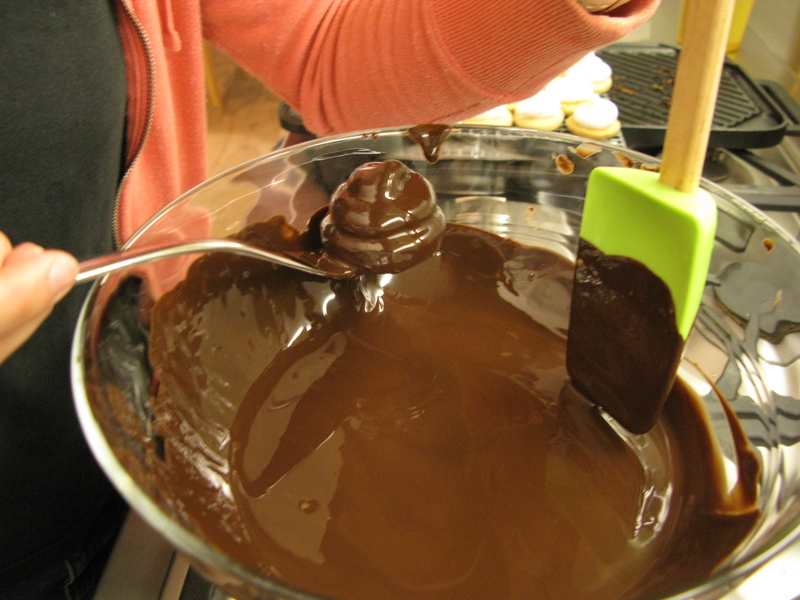 I blame my oven…it just means I’ll have to try again! 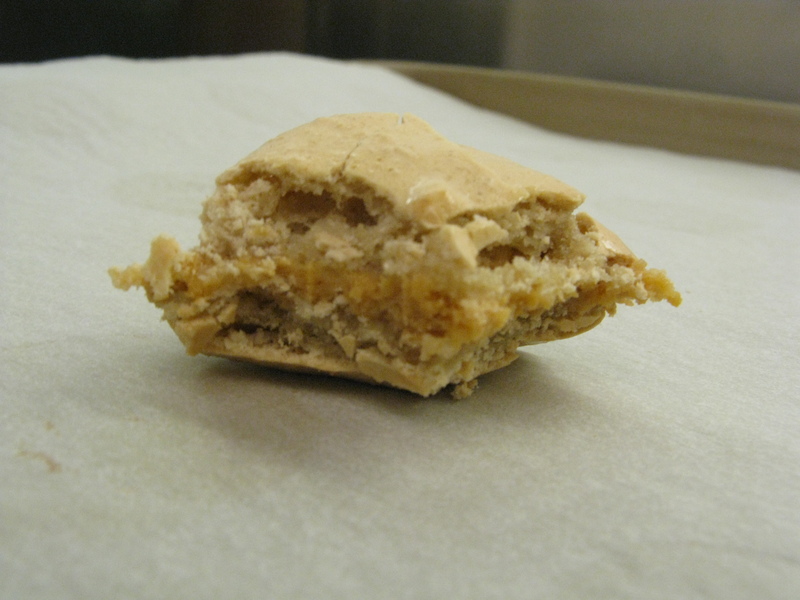 Moving onto the filling – I really really really wanted a strongly flavored, not too sweet or greasy, filling. 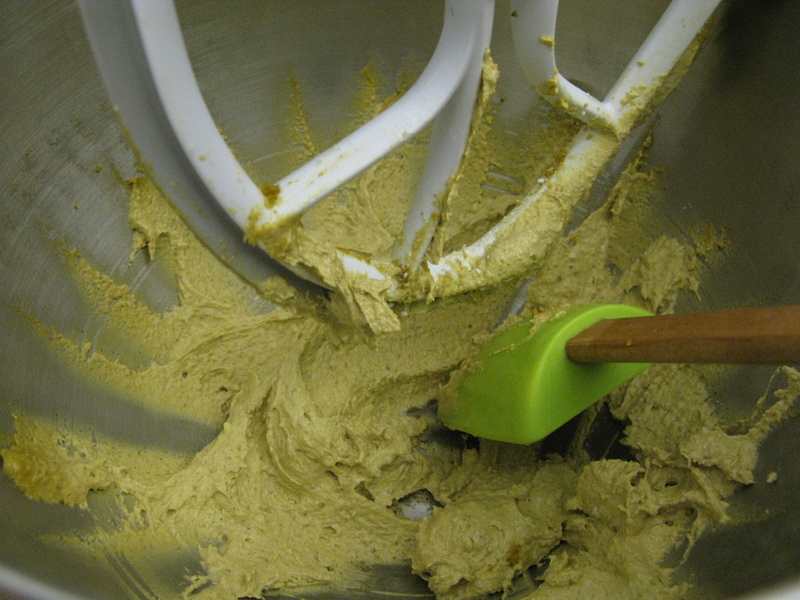 I ended up making my own pistachio paste (grinding more pistachios, boiling more sugar syrup) and beating it with softened butter and powdered sugar. The look on my husband’s face when I asked him to taste it tells me it was a success. Sorry – it’s such an appealing color, isn’t it? I ended up adding just a hint of green food coloring to help it out. Then pipe, pipe, pipe…voila! Sorry for the bad picture – this was literally the only one left from the batch. I looked at the calendar the other day and I realized it had been a few months since I last posted anything here. I sincerely apologize to anyone who checks in here regularly…I really do want to get to this more frequently, but it’s just so much work sometimes! As usual, lack of posts does not mean lack of activity in the kitchen. 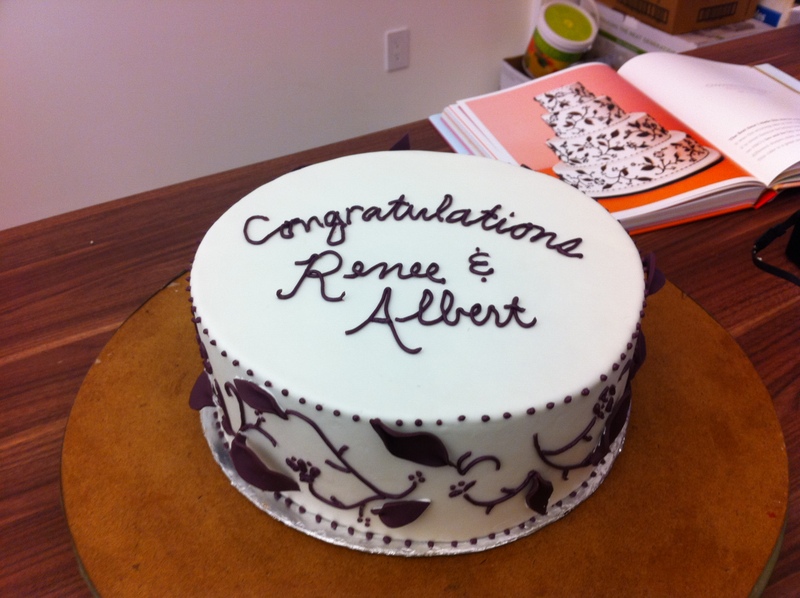 One of the projects I was most excited about recently was an engagement cake I did for some friends of ours. 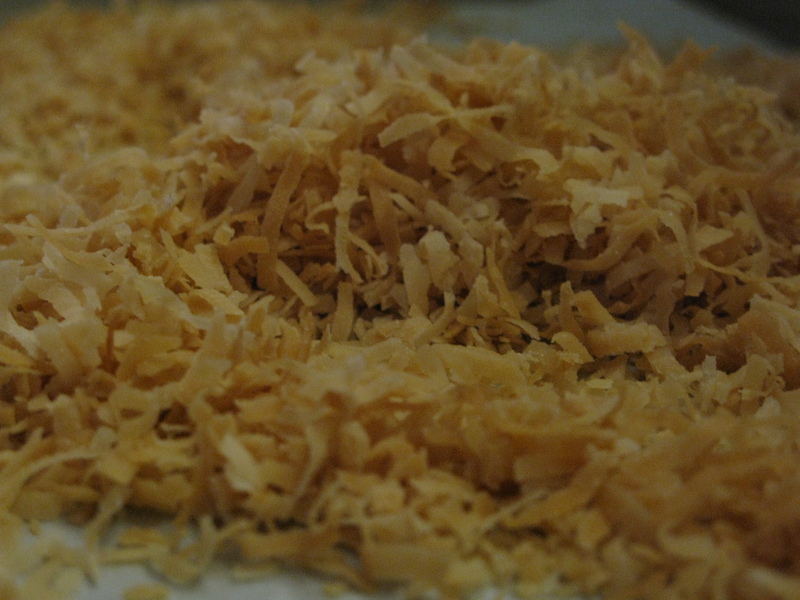 I only have pictures of the final product because…well, honestly, I don’t know why. I remember taking a few process shots, but they seemed to have evaporated from the camera. 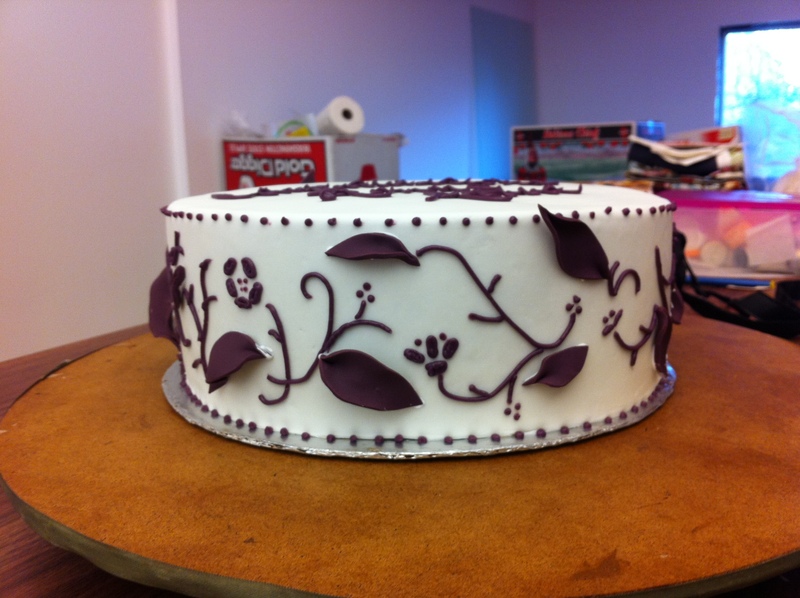 I was particularly interested in the process of this cake because I was trying a different technique for icing the cake prior to covering it in fondant. Oh well. Sorry for the quality of the pictures, too. These were taken on my phone. I know, I know. I’m so lazy. 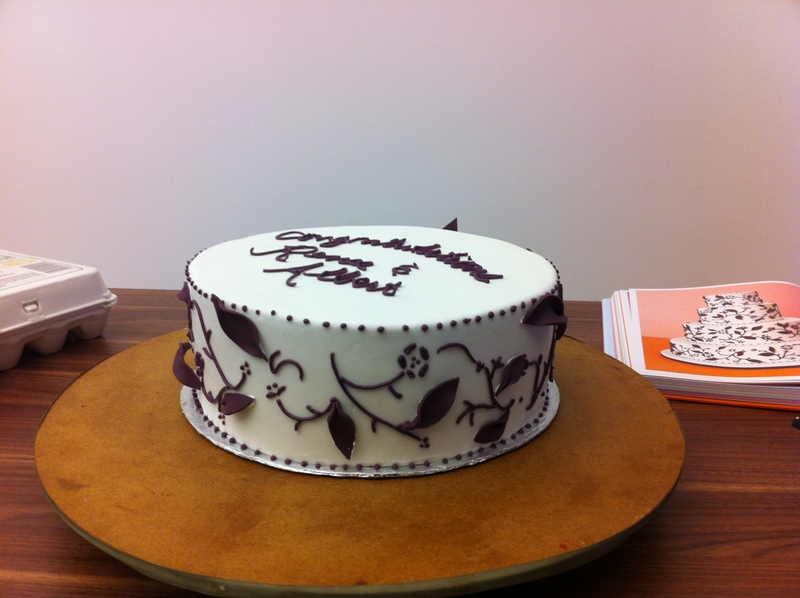 The inside of the cake was a devil’s food cake filled with chocolate ganache. The difference I mentioned earlier was covering the cake in a ganache (rather than buttercream) prior to putting the fondant on. 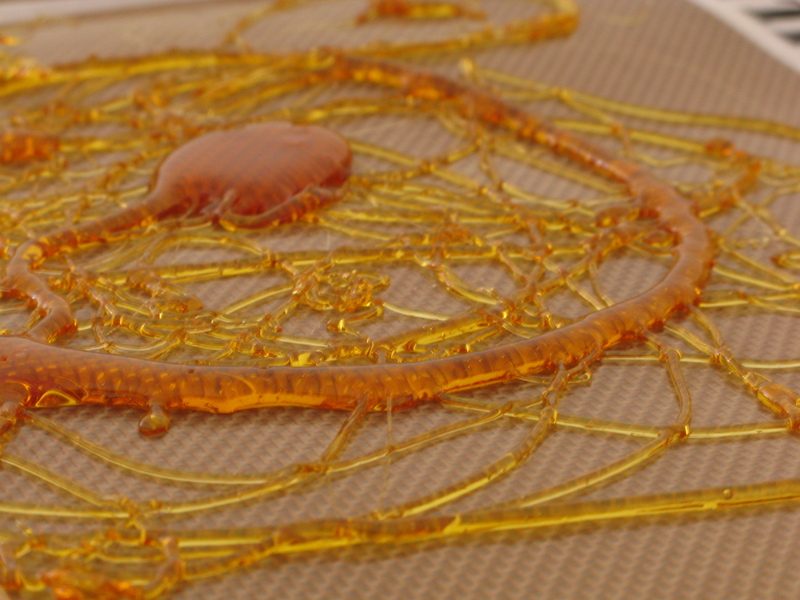 The goal was to create a smoother surface, thus allowing crisper edges – which I think I mostly achieved. I recently participated in an event my lovely friend, Anna, hosted, called Cook for a Cause. The idea is that 7 people prepare dishes featuring a secret ingredient, and 7 other people provide wine pairings. Each dish is judged on use of secret ingredient, taste, cohesiveness with other dishes, and originality. Money is donated to the winner’s choice of organization. Click here for more details about this (hopefully) monthly event. 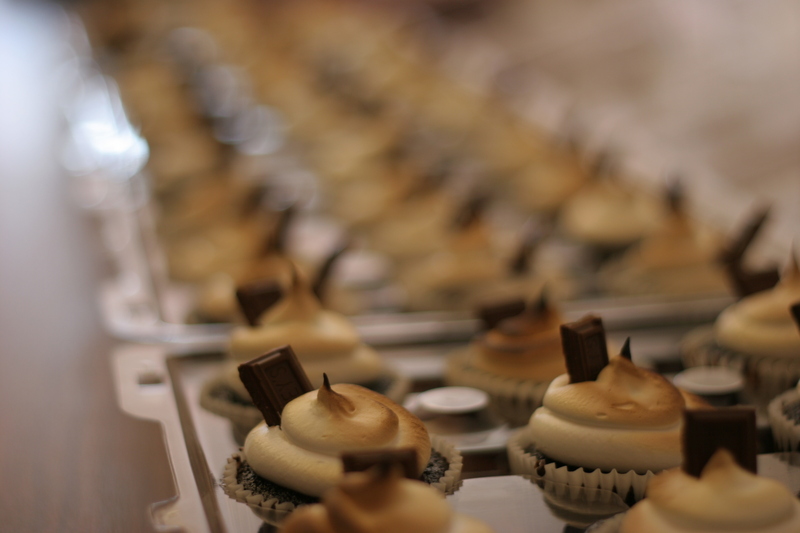 It was a really great event – really fun with really yummy food. This month’s secret ingredient was apples, so I chose to make rustic apple tarts and an apple bread pudding. This was the first time I had ever made a bread pudding, which was probably not the best idea for a cooking competition, but I guess it worked out okay. 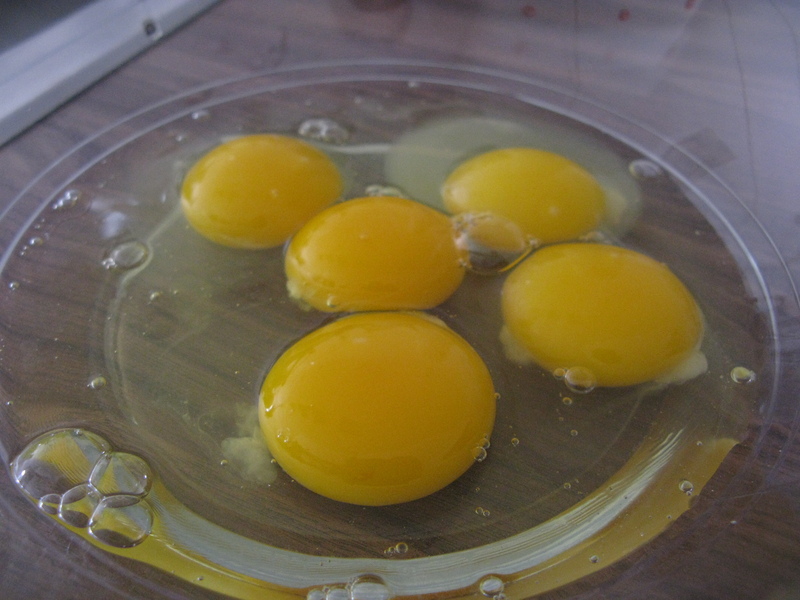 Next came the custard for the pudding…lots of eggs! Add in heavy cream, sugar, vanilla, salt, cinnamon, and apple juice and you get this lovely concoction. 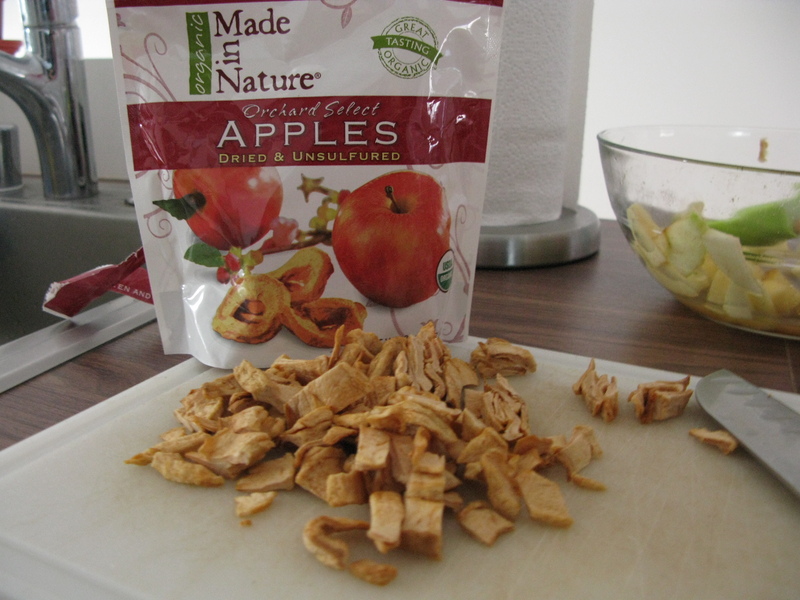 In addition to chunks of fresh apple, I cut up some dried apple to enhance the appley-ness. And then dump most of the bread and the apples into the custard stuff. After tossing to coat the bread, I poured it all into a baking dish to hang out for awhile. After about an hour in the oven.. This picture really doesn’t do justice to the warm, creamy yumminess that resulted…it was a total shock to me, but this bread pudding won the Cook for a Cause! I was so surprised I didn’t have an organization ready to donate to…in the end I opted to donate to the Sudan House of Hope Hospital – a project my husband has been involved in. 1. Adjust oven racks to middle and lower-middle positions and heat oven to 325 degrees. 2. 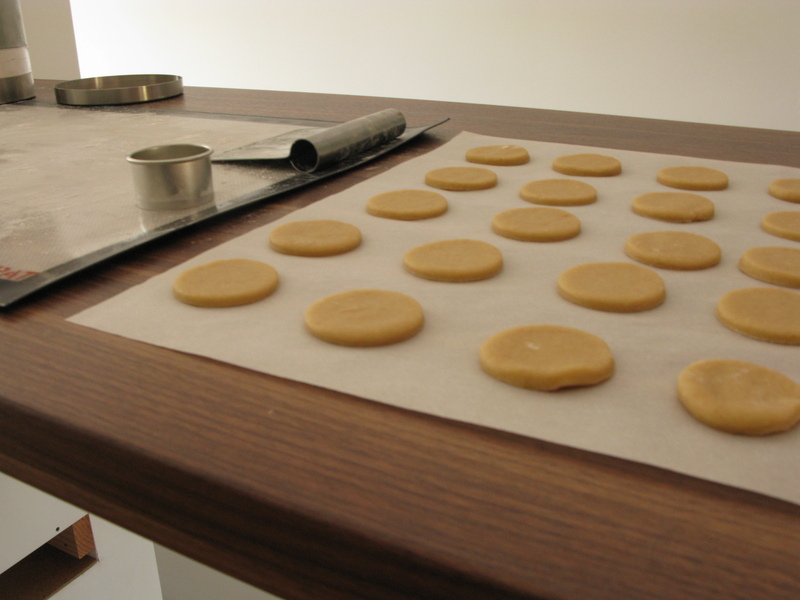 Spread bread cubes in single layer on 2 rimmed baking sheets. Bake, tossing occasionally, until just dry, about 15 minutes, switching trays from top to bottom racks halfway through. 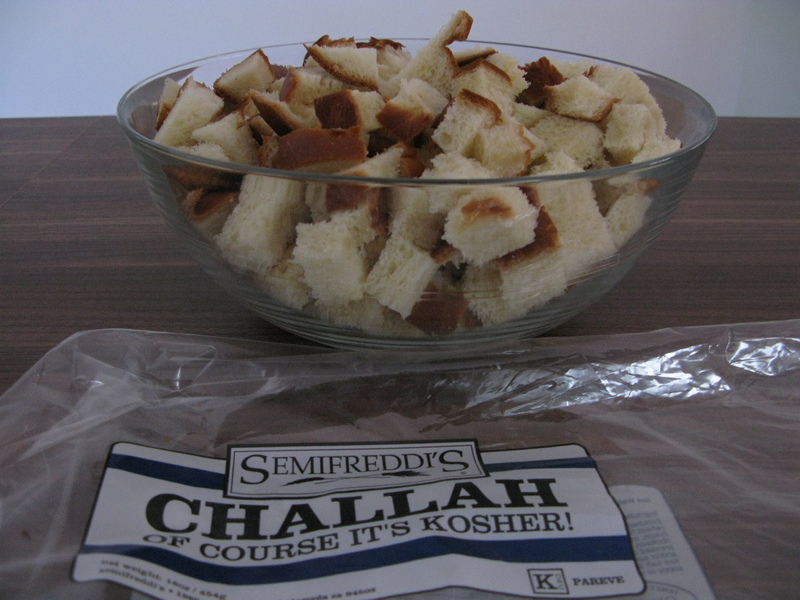 Cool bread cubes about 15 minutes; set aside 2 cups. 3. Whisk eggs and yolk, sugar, vanilla, cinnamon, and salt in a large bowl. 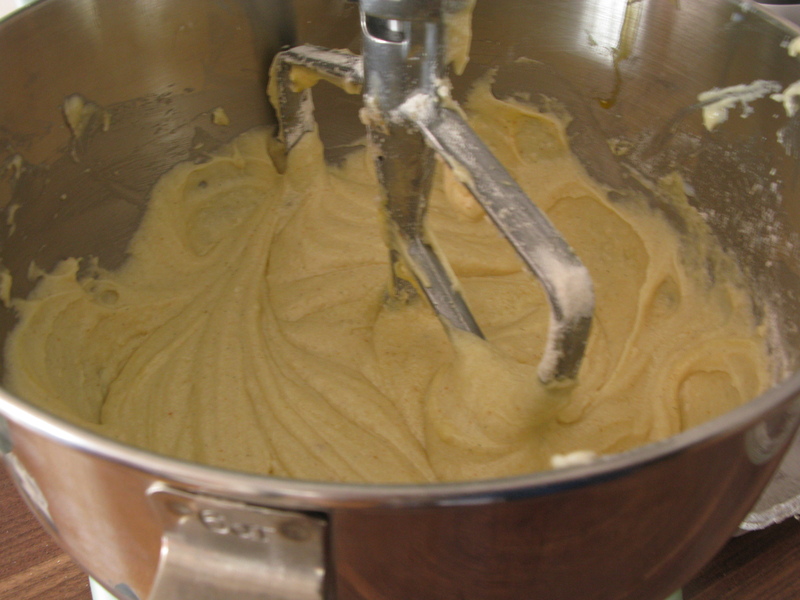 Whisk in cream and juice. 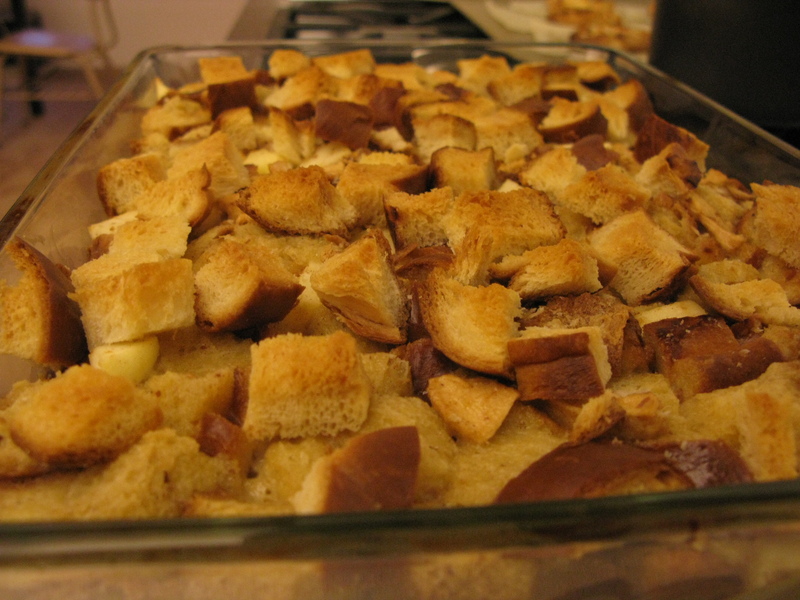 Add remaining 8 cups of bread cubes and fresh and dried apples. 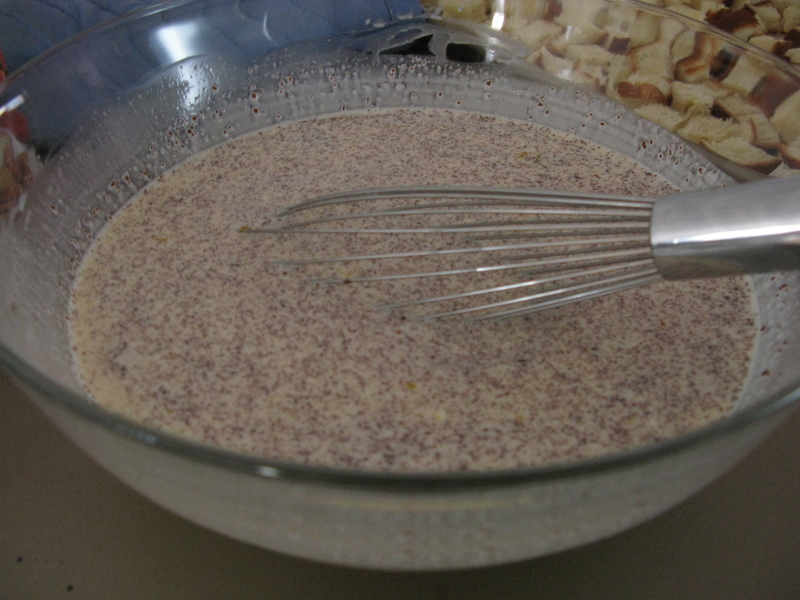 Toss mixture to coat bread and apples in custard. 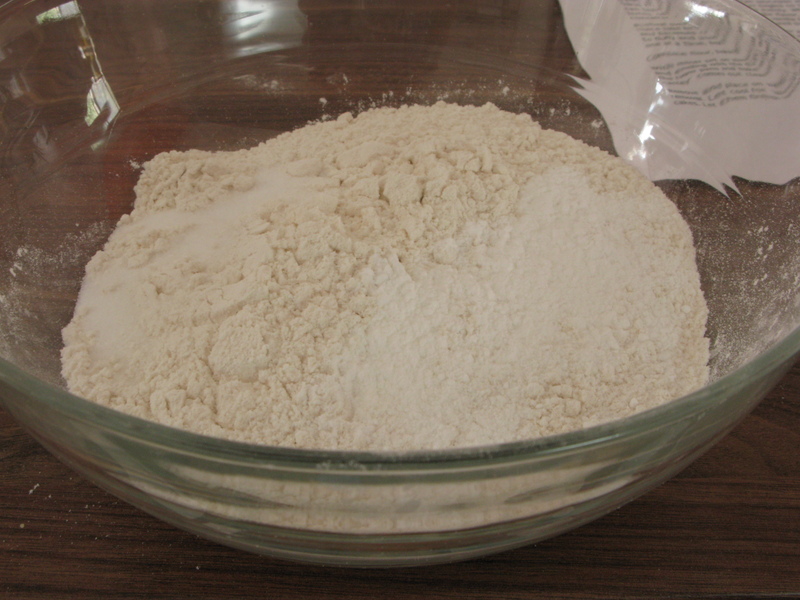 Transfer mixture to a 13 x 9-inch baking dish and let stand, occasionally pressing bread cubes into custard, until cubes are thoroughly saturated, about 30 minutes to an hour. 4. 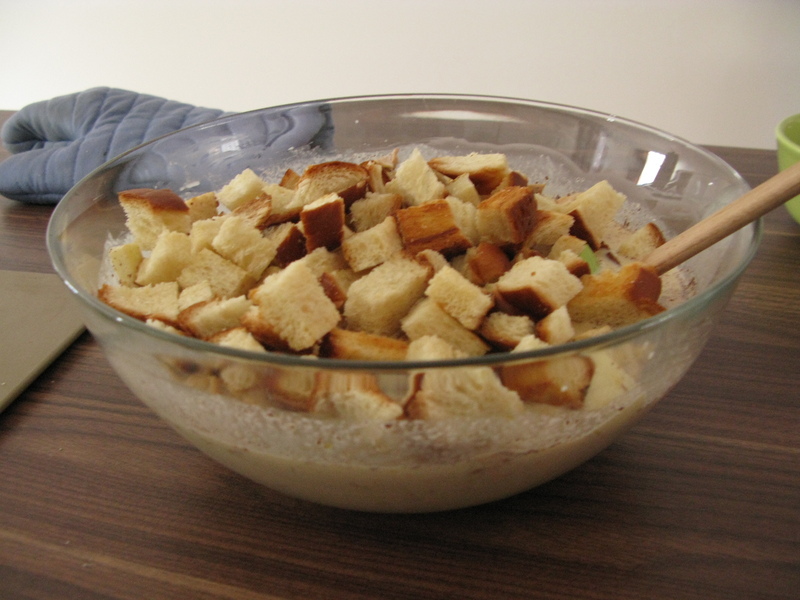 Spread reserved bread cubes evenly over top of soaked bread mixture and gently press into custard. Using pastry brush, dab melted butter over top of unsoaked bread pieces. 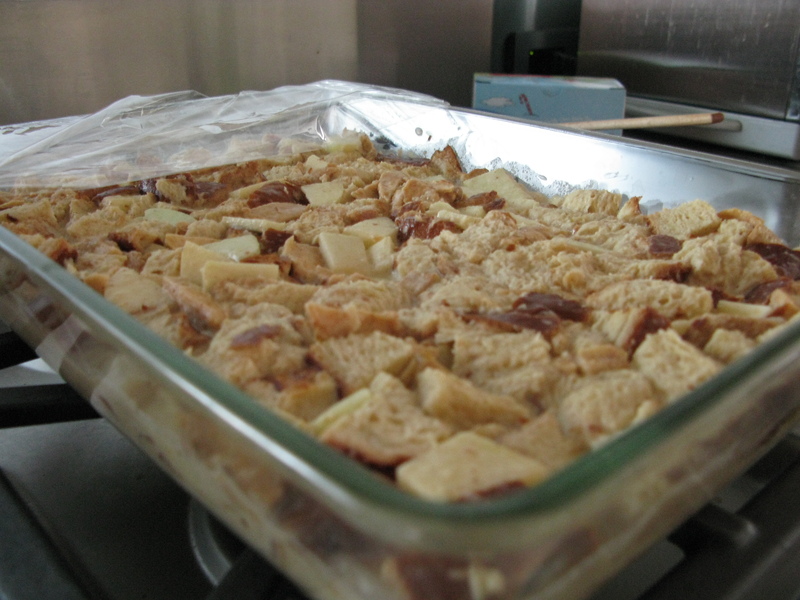 Place bread pudding on rimmed baking sheet and bake on middle rack until custard has just set – about 45 to 50 minutes. 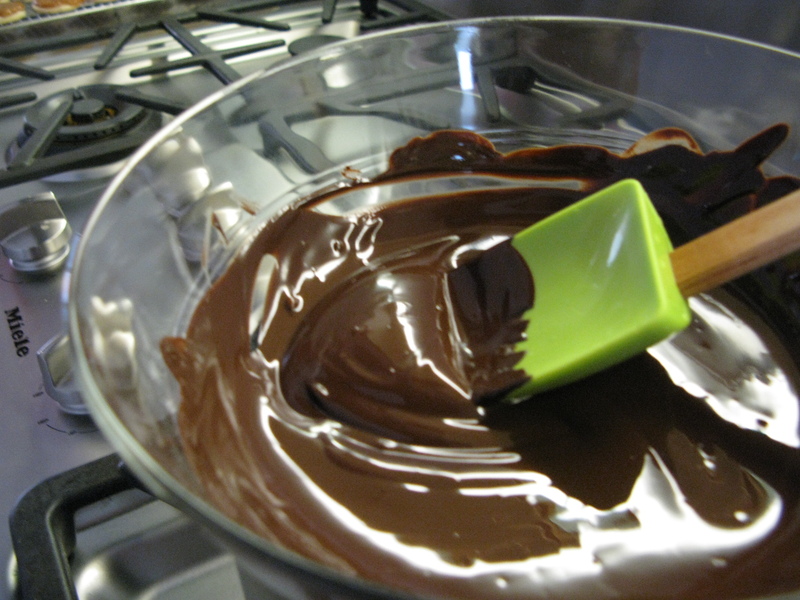 (Done when pressing on center of pudding with finger reveals no runny liquid). Transfer to wire rack and cool until pudding is set and just warm – about 45 minutes. Serve. 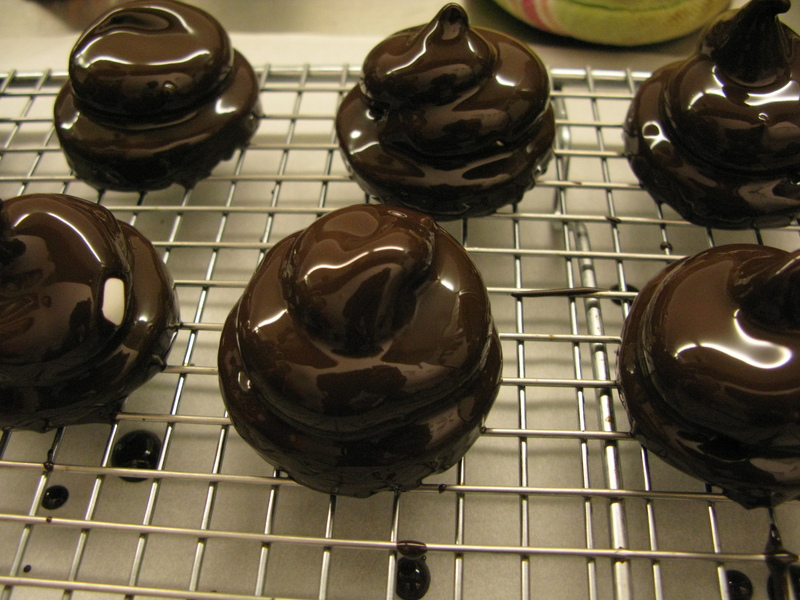 Did you grow up eating Mallomars as a kid? I remember reading about them in books and hearing about them, but I don’t know that I’ve ever had an actual Mallomar. For those of you not familiar with them, you can view the official Nabisco cookie here. 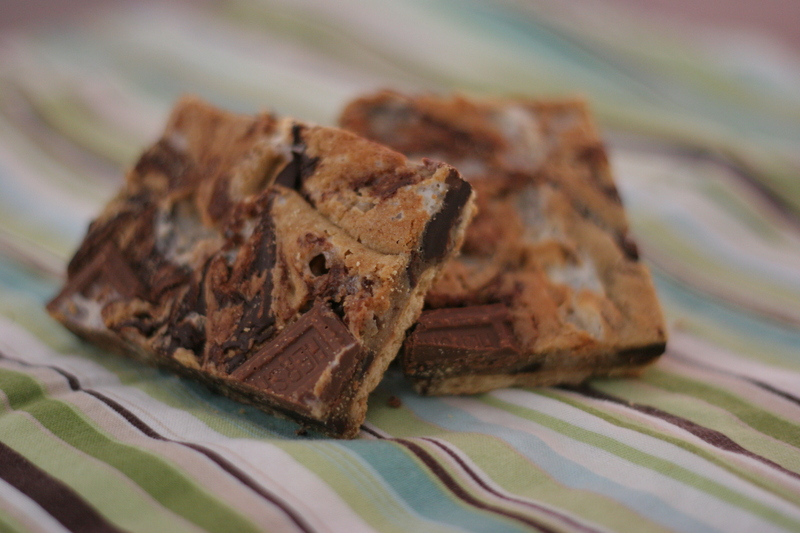 They are essentially a graham cracker base with a “kiss” of marshmallow on top, enrobed in chocolate. Sorta like a cold s’more. Pretty excellent stuff. 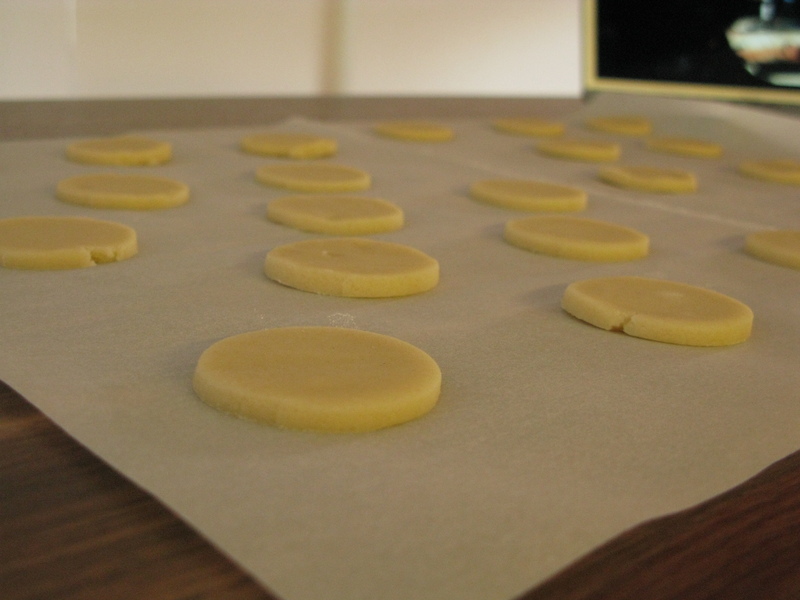 So we start the cookie base…officially, not a graham cracker base since I did not use any graham flour. 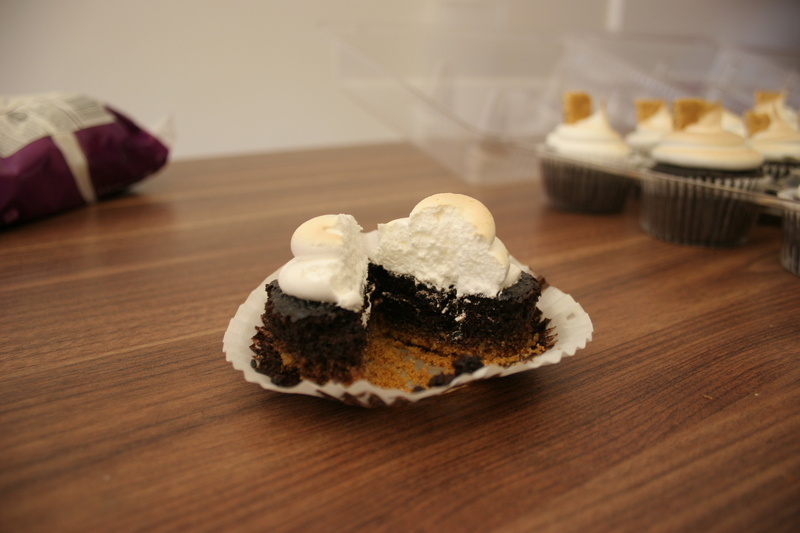 After those are baked and cooled, I piped a swirl of marshmallow on top…that’s right I made marshmallow. And it was awesome. Sorry, there are no pictures of that because I couldn’t manage boiling sugar syrup, beating egg whites and a camera all at the same time. I’m just not slick enough for that. 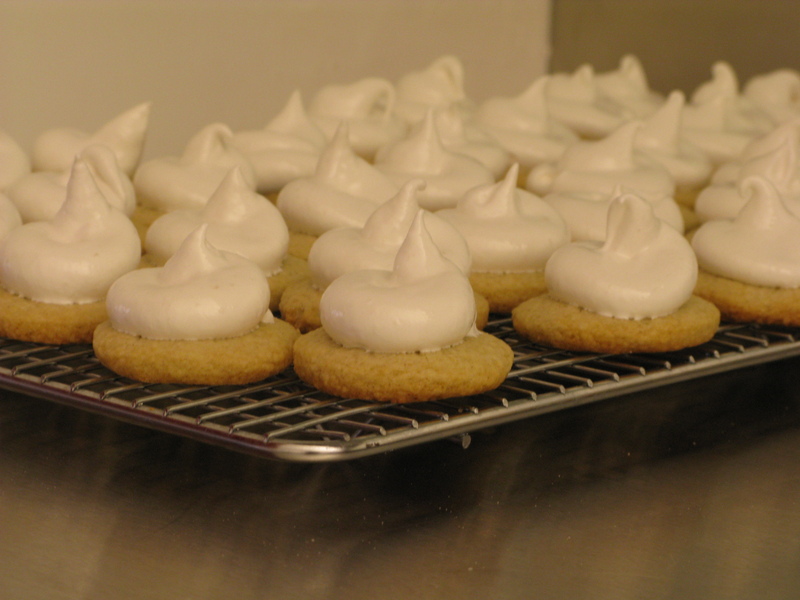 I was probably a bit generous with the marshmallow, which meant that some of the cookies didn’t get any. Sad. But the ones that did were pretty happy! 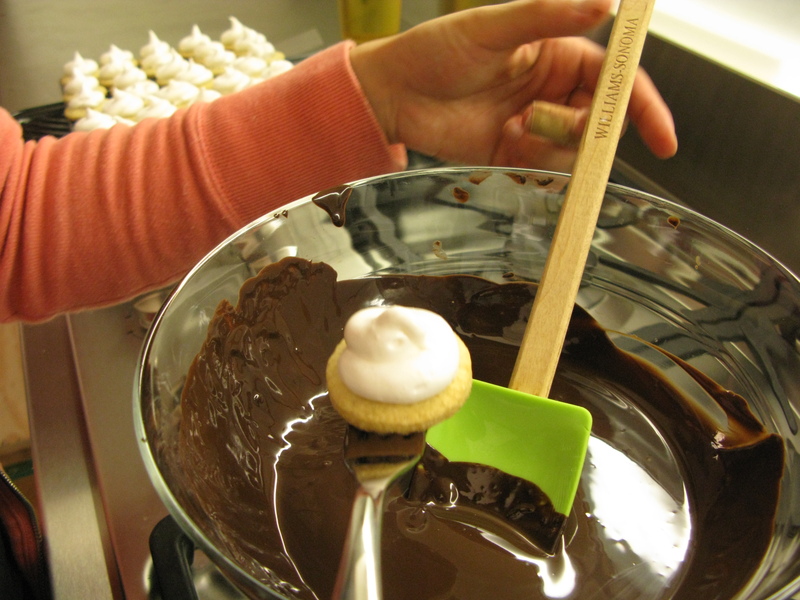 And then add sprinkles for fun! I was pretty happy with the way these turned out. The only thing I would do differently would be to pipe the marshmallow on a little differently…I would probably stay away from a swirl-type look to minimize an unfortunate resemblance to something less appetizing. But their appearance didn’t stop anyone from eating these! This was a recipe I adapted a bit from something I saw on Dessert First. I made them for an event at church at the request of my husband…since he asked for it, I decided to make something that he might actually enjoy. 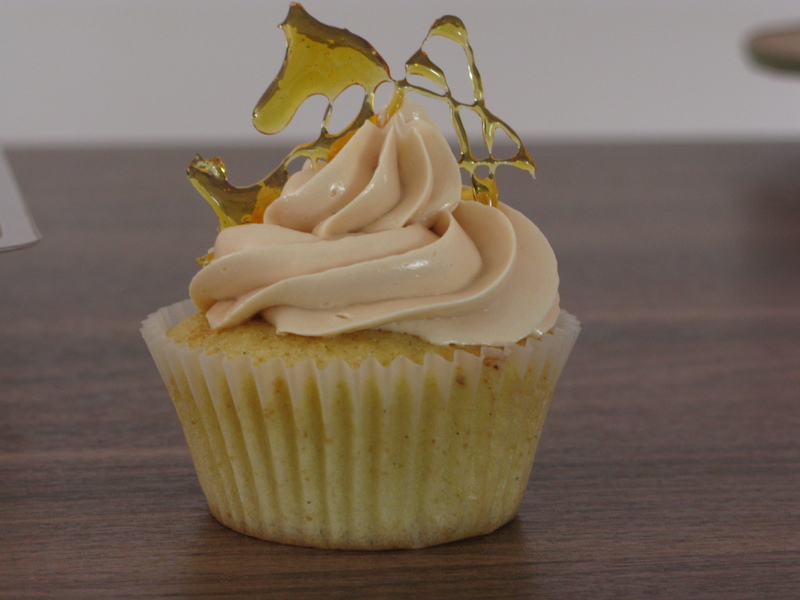 The cake part is actually a browned butter vanilla bean cake – fancy-schmancy, no? It doesn’t get much more gourmet sounding than that. 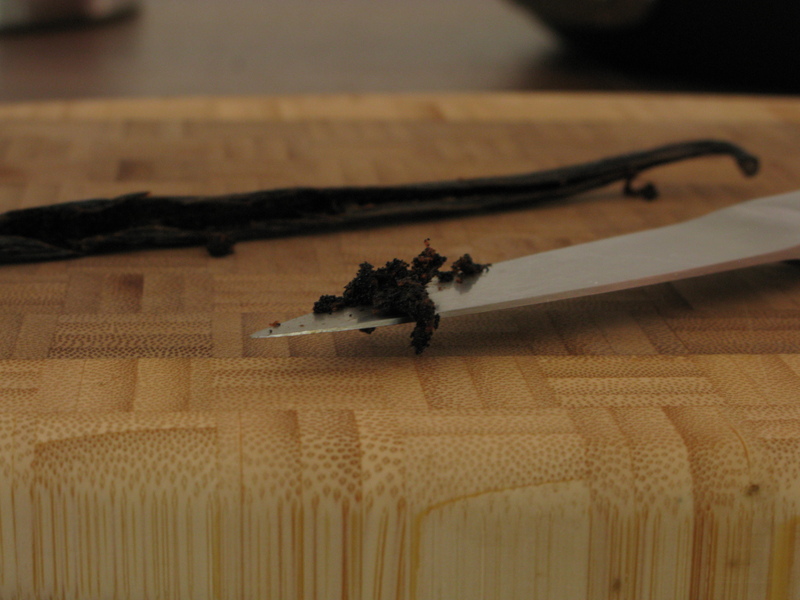 So we start with vanilla beans…and scrape out the seeds. Dump the seeds and the pod into a frying pan full o’ butter. It’s beautiful. 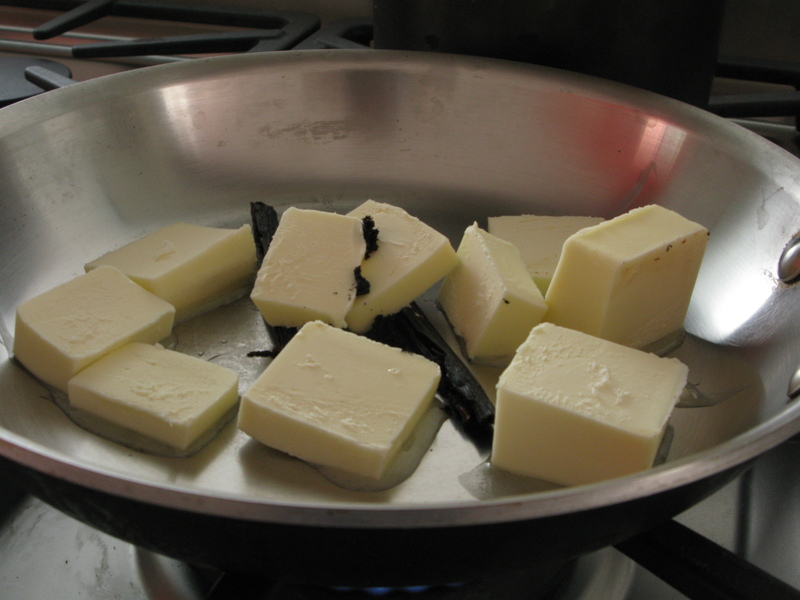 While the butter is browning, mix the dry ingredients. 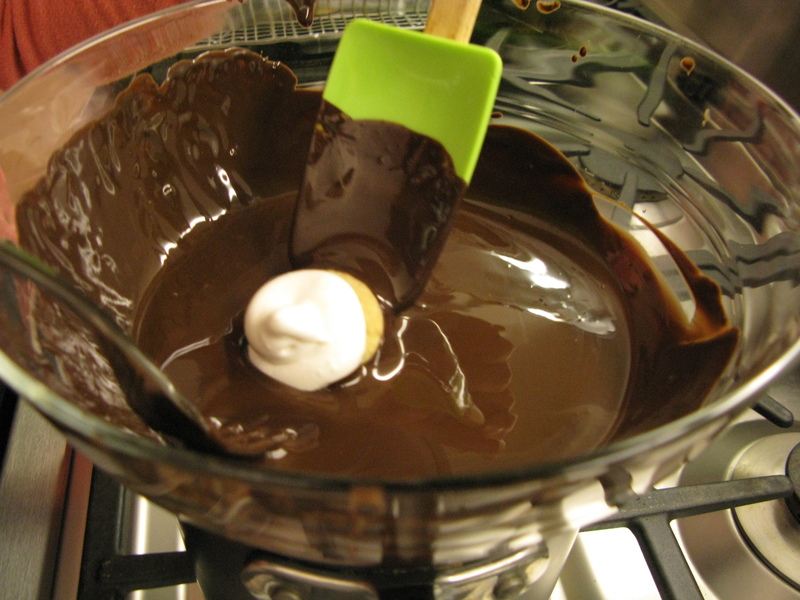 Mix the browned butter/vanilla bean mixture, the dry stuff and some eggs in the mixer. Whee! 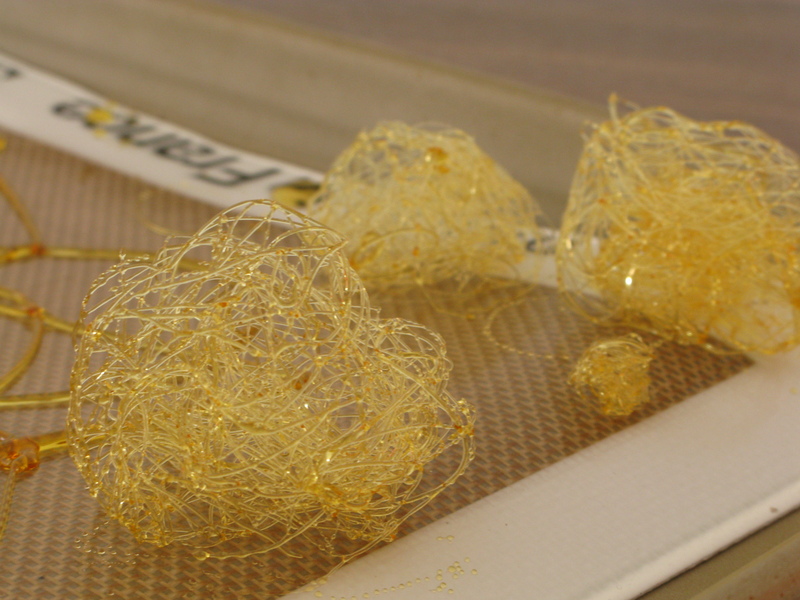 Batter gets portioned into cups…yadda yadda yadda…bake in the oven…yadda yadda yadda…while the cupcakes are baking, I got a little overly ambitious and decided to play with spun sugar. 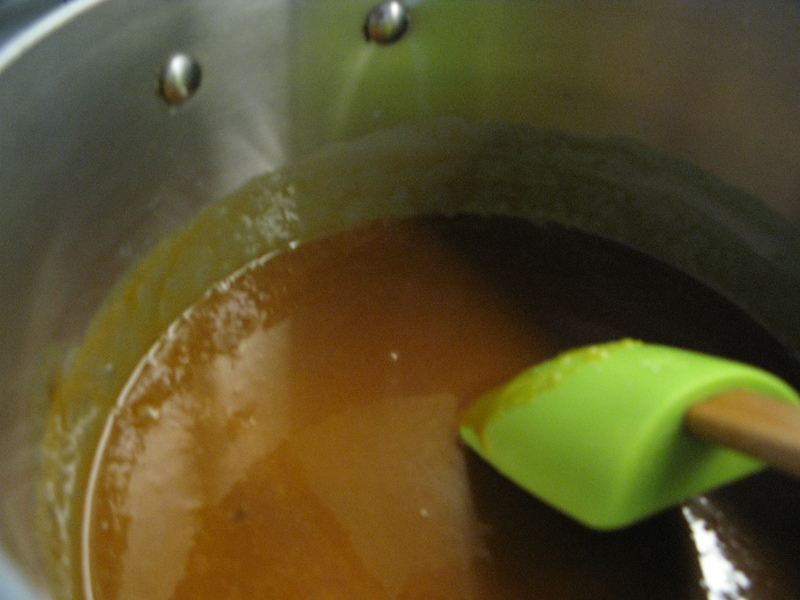 Of course, I went against every single piece of advice in making caramel and did all of this on one of the most humid days of the year. 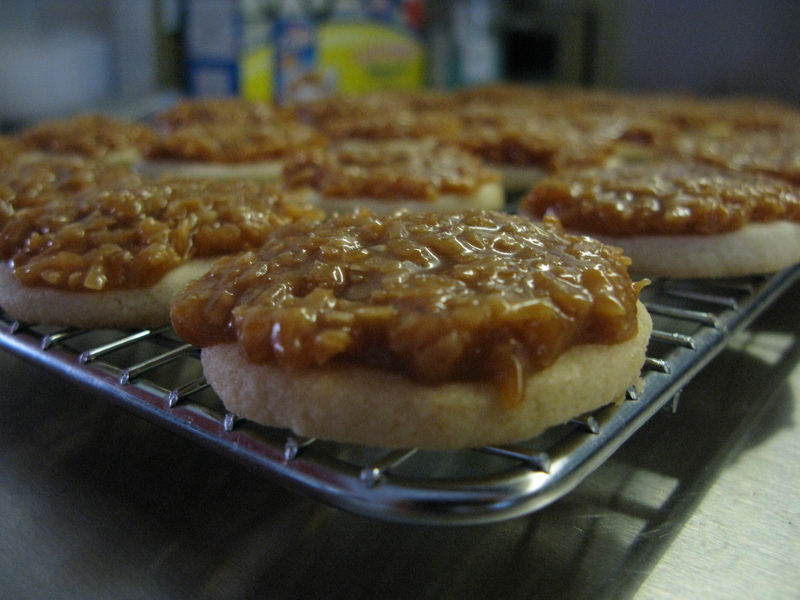 Thus the large chunky caramel pieces I ended up using. 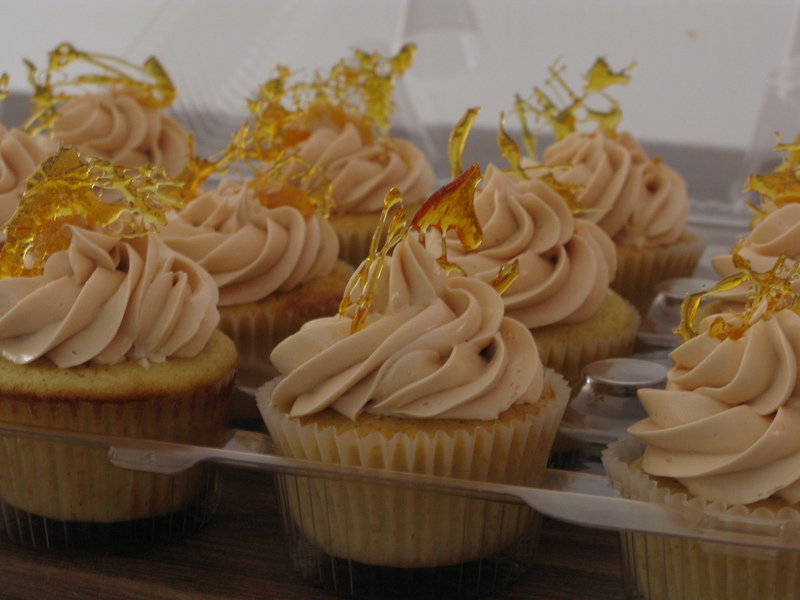 I made a lovely batch of caramel and mixed it in to a batch of my trusty swiss-meringue buttercream…swirled it on the cupcakes, and voila! I was totally enthralled with the way the frosting turned out, but wasn’t too thrilled with the cake. I could not discern the browned butter flavor, and the cake was a bit on the dense side for me, but an otherwise not too shabby cake!